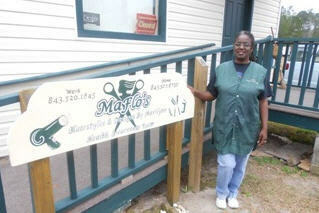 MaFlo’s Beauty Salon in Georgetown, SC, population 8,441, is a compact 20-by-20-foot wooden-frame building with a newly erected sign in front that reads: “MaFlo’s Hairstyles & Designs by Marilynn–Health Awareness Team.” In front, as you enter, are three hair drying chairs with portraits of clients on the walls above; on the right are two styling chairs; and on the left is a waiting area with several comfortable chairs, a desktop computer workstation, two laptops and a printer. Finding health information in a hair salon may seem like an odd combination, but it makes perfect sense. In addition to owning MaFlo’s, Lance-Robb teaches health and computer classes at the local library on her day off. And the computers with Wi-Fi Internet access at MaFlo’s are part of an innovative program that seeks to bring health information to underserved people. The funding comes from the National Network of Libraries of Medicine (NN/LM), Southeastern/Atlantic Region (SE/A). The National Network of Libraries of Medicine, anchored by eight Regional Medical Libraries and coordinated by the National Library of Medicine, was created to help health providers and the public access health information no matter where they live or work. “We try to go to where the people are,” says Nancy Patterson, the Community Outreach Coordinator for Southeastern/Atlantic Regional Medical Library. “I call it ‘thinking inside the blocks. '” That means, she says, bringing health information to underserved people in their own environment. Going to where the people are entails a bit of travel for Patterson, whose region covers 13 states and territories and supports more than 1,000 libraries and information centers like MaFlo’s. While staying in touch with her region last year, Patterson logged about 45,000 air miles with an additional 5,500 miles by car from her home office at the University of Maryland, Baltimore. With such a large geographic area to cover, Patterson focuses on a “train the trainer” approach for the community outreach program: find reliable and passionate people who have creative ideas for helping others obtain health information and give them the materials and training they need to provide outreach in their communities. This approach creates tendrils of outreach beyond what she can do alone. Lance-Robb first started thinking about community outreach in 2006 when her interest in community health education brought her together with Barbara Carlson, a health sciences librarian at Medical University of South Carolina (MUSC), and the Coordinator of Diabetes/Library Outreach Services for Racial and Ethnic Approaches to Community Health (REACH) 2010. Together, along with others, they helped the Charleston and Georgetown Diabetes Coalition Library Partnership win the 2006 National Health Information Award for Libraries from the US National Commission on Libraries and Information Science (NCLIS). The National Health Information Awards program honors excellence in consumer health information. Winning the award, Lance-Robb recalls, started her thinking of other ways to help her community. Georgetown, the third oldest settlement in SC, shares many of the health concerns of small communities across the region: diabetes, kidney failure, hypertension, obesity and heart disease. Carlson told her of the NN/LM SE/A funding program. 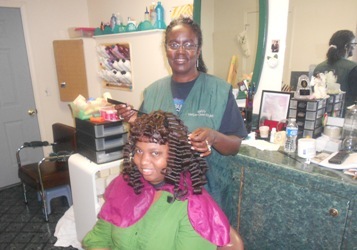 Lance-Robb applied, using her beauty salon as a base for community health information and Internet access, as well as offering computer tips and basics in classes at the local community center. She received her first award of $5,000 in 2006 for hardware and software at the salon and for teaching classes at the community center, and has received funding since. Lance-Robb named MaFlo’s after her mother, Florine, who, along with her father, was a strong and caring influence on her life. “We used to call her Flo Jo, so I took Mama and put the two together and came up with the name MaFlo’s,” Lance-Robb explains. The name reflects the bond she had with her parents. “My parents instilled a lot of strong morals and values in all of their 10 children. Although both of them are gone now they are deeply rooted in my heart,” a memory, she says that still fuels her commitment to helping others. Top photo: Marilynn Lance-Robb outside her Georgetown, SC hair salon and information center. 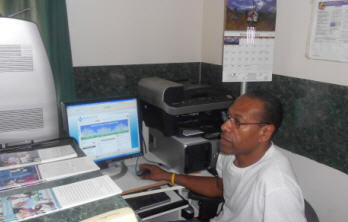 Middle Photo: Dexter Waiters uses the computer at MaFlo’s to access the MedlinePlus consumer health Web site. Dexter says he started out knowing little about computers and now owns a laptop. Bottom photo: Marilynn Lance-Robb with Gloria D. Nesbit, a client of Marilynn’s for more than 20 years, who regularly uses the hair salon’s computers to search for reliable health information.